A Chilean appeals court has accepted to consider a request for an injunction against Canada’s Barrick Gold (NYSE, TSX: ABX) and its Pascua Lama project, filed by a group of northern natives in conjunction with the local government’s environmental evaluation committee. According to radio University of Chile, the decision is based on studies that show the destruction of three glaciers close to Pascua Lama: Toro 1, Toro 2 and Esperanza. The reports also show water resources have been heavily polluted due to deposition of sterile before the acid rock drainage plan starts operating, which would have prevented the damage. However, the director of the Latin American Observatory of Environmental Conflicts (OLCA), Lucio Cuenca, is warning there are reasons to question the true intentions of the legal action. He told the local radio station the five indigenous communities who filed the legal complain don’t represent the majority of the local groups who live in the area. He added they are likely to be mainly seeking monetary compensations. The lawyer who presented the motion, Lorenzo Soto, says he is aiming for an order to stop works at Pascua Lama, adding he is not ruling out potential compensations for the communities affected by Barrick’s project. Asked about the issue, Barrick’s vice president of public affairs in Chile, Rodrigo Jimenez, told Emol.com in a written response that they "have not been notified of the application for protection as a company (…) What I can assure now is that we are committed to fulfilling the commitments, obligations and actions arising from any of the environmental resolutions that lead to Pascua Lama’s approval." In practical terms, yesterday’s resolution only means that the court considered a legal action against Barrick is reasonable. The next step will be for the company, the indigenous groups and authorities to provide relevant background and proofs to the Chilean justice. In July Barrick announced it was delaying the start-up of its Pascua-Lama mine, straddling the border between Chile and Argentina, for about a year, since a review of the company’s development projects showed the South American mine costs would jump as much as 60%. 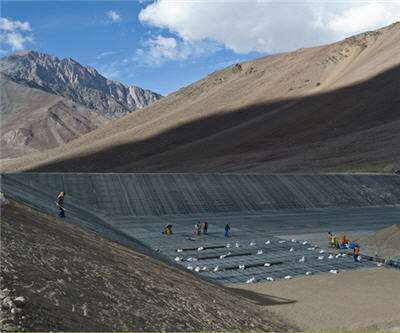 Image: Barrick's gold, silver, copper Pascua Lama project. Clarification: The original story published Thursday stated the appeals court had granted a injunction, but our sources have now said that the court has only agreed to hear the injunction request.